Fully Machined Steel Base Plates for Gator and other manual lathe chucks. Precision Ground and Heat Treated. Base plates can be used to mount manual lathe chucks on a variety of table operations. 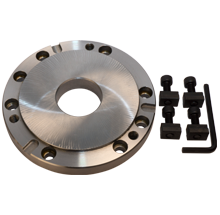 They are ideal for use on CNC or Manual Rotary Tables and Indexers with 3/6 and 4/8 T-Slots. All Gator Base Plates are made of steel, are heat treated and are provided with mounting bolts and T-Nuts. Fully Machined Base Plates for 3 & 6 Jaw PA Steel Body Adjustable Chucks 0.0004” T.I.R.